Facebook has just announced a major new feature that it’s launching in tandem with Skype: video calling. 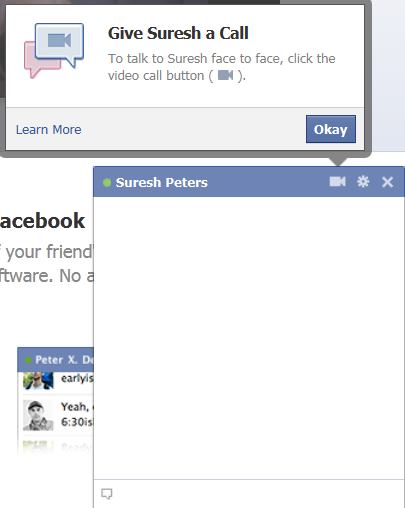 To start video calling now, visit Video calling on Facebook and click Get Started. It’s a feature that’s been rumored for quite a while, and it’s one that Facebook is putting a lot of weight behind. Now, whenever you browse to a friend’s profile, you’ll see a new button nestled between the ‘Message’ and ‘Poke’ buttons that says ‘Call’. Click that, the other user will see a popup asking if they want to accept a call, and you’ll be immediately connected (you’ll need to install a small plugin the first time you use the service). — Facebook is launching a new chat sidebar today that by default it takes the entire right side of the screen, and the first time you click on any user you’ll see a prompt asking if you’d like to make your first video call. If you try to initiate a video call and the other user doesn’t respond, you’ll be prompted to send them a video message. So why is this a big deal? Facebook emphasized the fact that users will not have to create new Skype accounts to make calls, and that this will allow users to call their friends and family with a very minimal amount of setup (the flow for installing the applet only took a few seconds). Of course, this comes just a week after the launch of Google+, which includes a video chat feature called ‘Hangouts’. Facebook’s video chat doesn’t support group chats yet, but when asked if Facebook will be rolling out group video calling, Zuckerberg said not to rule anything out. He added that one-to-one calling makes up the vast majority of video calling. Skype CEO Tony Bates took the stage to make a few comments. One important thing he noted: Skype is talking with Facebook about having some paid products available through the web format. 1 Respones to "Facebook Launched Video Calling"
Ah, so that was the "big announcement" Facebook had teased users with.